Helping you find what you need for your business. Download "Helping you find what you need for your business." 3 APRIL 6-12, 2018 HOUSTON BUSINESS JOURNAL 41 ADVERTISEMENT FOR BIDS CITY OF HOUSTON The City Secretary for City of Houston will receive bids at 900 Bagby, Room P101, Houston, Texas for the following General Services Department projects: Bid Date: Thursday, April 19, 2018 Estimated Construction Cost: $190, Pre-bid Meeting: Police Lake Patrol Underground Storage Tank Removal and Remediation, and Aboveground Storage Tank Installation & Police Helicopter Patrol Aboveground Storage Tank Replacement West Shorewood Loop, Huffman, Texas (Key Map 338-V) 8402 Larson Street, Houston, Texas (Key Map 575-F) Tim McDonald/ Tuesday April 10, 2018, 10:00 A.M. at West Shorewood Loop, Huffman, Texas (Key Map 338-V) Tuesday April 10, 2018, 1:00 P.M. at 8402 Larson Street, Houston, Texas (Key Map 575-F) Bids will be accepted until 10:30 a.m., local time on the Bid Date shown above. Bids received after that time will not be accepted. Bids will be publicly opened and read aloud at 11:00 a.m. on the same day in City Council Chambers. All interested parties are invited to attend. Place and date of Bid opening may be changed in accordance with Sections 15 3(b) (5) and 15-3(b)(6) of the City of Houston Code of Ordinances. Low bidder shall comply with City of Houston Code of Ordinances. All bidders shall comply with Article II, Chapter 15, City of Houston Code of Ordinances. Bid Documents (Compact Discs) may be picked up at the City Hall Annex, 900 Bagby, 2 nd Floor. A maximum of one disc will be available to each prospective bidder. Addenda will be distributed at no cost to those who are registered plan holders with the City Bid Documents may be examined at plan rooms listed on the City plan holders list or listed in Document Supplementary Instructions to Bidders. Bidders shall comply with City of Houston Code of Ordinances, Chapter 15, Articles V, VI, and IX, and Executive Order No. 1-2 (June 14, 1995), and City of Houston Affirmative Action and Contract Compliance Division Minority/Women-owned Business Enterprise (MWBE) Procedures (June 1995). Low Bidder will be required to make good faith efforts to achieve MWBE and Small Business Enterprise (SBE) participation goals as stated in Document Supplementary Conditions. It is unlawful for any Contractor to contribute or offer any contribution to a candidate for City elective office during a certain period prior to and following a contract award. Bidders should refer to Chapter 18, City of Houston Code of Ordinances for filing requirements and further explanation. Dated: (Friday, March 30 and Friday, April 6, 2018) Anna Russell City Secretary Sealed bids, in duplicate, addressed to Harris County Fresh Water Supply District No. 61 will be received at the office of the District, Cypress North Houston, Cypress, Texas 77429, until 10:00 a.m., April 17, 2018, and then publicly opened and read for furnishing all labor, material and equipment and performing all work required for the construction of the following work: Proposed 4 Force Main to Serve West End Lumber Yard Harris County Fresh Water Supply District No. 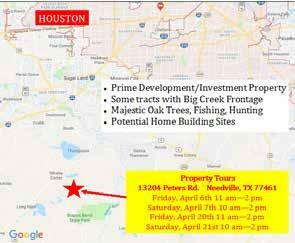 61; Harris County, Texas; Project No A mandatory pre-bid conference for prospective bidders will be held at the office of the District, Cypress North Houston, Cypress, Texas 77429, on April 10, 2018, at 10:00 a.m. No person may represent more than one bidder at the pre-bid conference. If a person claims to represent more than one bidder at the pre-bid conference, the bid of each bidder so represented will be returned unopened. Each bid shall be submitted on the prescribed form and accompanied by a bid bond, cashier s check or certified check in the amount equal to ten percent (10%) of total base bid. If certified or cashier s check is used as bid security, check must be drawn on a responsible bank located in the State of Texas and made payable to Owner only. Drawings, specifications and bid documents may be obtained from search Proposed 4 Force Main to Serve West End Lumber Yard ID It is the responsibility of the contractor bidding the project to ensure the accuracy of the reproduction of all bid documents and construction drawings. This responsibility includes, but is not limited to, proper scaling, paper width and length, etc. Failure to do so may result in errors in the unit bid quantities and/or bid amounts. The Owner reserves the right to waive any informalities or minor defects and to reject any or all bids. In case of the lack of clarity or ambiguity in prices, the Owner reserves the right to accept the most advantageous or reject the bid. The successful bidder will be required to provide payment and performance bonds in the amount of one hundred percent (100%) of the contract price. Attention: The District may not accept this bid until it has received from the bidder a completed, signed, and notarized TEC Form 1295 complete with a certificate number assigned by the Texas Ethics Commission ( TEC ), pursuant to Texas Government Code and the rules promulgated thereunder by the TEC. The undersigned understands that failure to provide said form complete with a certificate number assigned by the TEC will result in a non-conforming bid and will prohibit the District from considering this bid for acceptance. To complete and submit Form 1295 and generate the Certification of Filing, please visit the Texas Ethics Commission s website at Sealed bids in duplicate addressed to Friendswood Development Company, on behalf of Montgomery County Municipal Utility District No. 24 will be received in the offices of Jones & Carter, Inc., 2322 West Grand Parkway North, Suite 150, Katy, Texas 77449, until 10:00 a.m., Friday, April 13, 2018, and then publicly opened and read for furnishing all labor, material and equipment and performing all work required for the construction of: Water, Sanitary, and Drainage Facilities in Country Colony Section 6. The project is located in Montgomery County Municipal Utility District No. 24, Montgomery County, Texas, and east of North Lake Houston Drive and north of Ricewood Dr. It is located in Key Map No. 297 E & F. For construction contracts $75,000 and over but less than $250,000, the bidder shall submit a certified or cashier s check on a responsible bank in the State equal to two percent (2%) of the maximum total bid amount. For construction contracts over $250,000, the bidder shall submit either a 2% certified or cashier s check or a five percent (5%) bid bond of the maximum total bid amount. Make the cashier s check or bid bonds payable to the Owner. Plans, specifications, and bidding documents are available at Said documents may be viewed at the Construction Division of Jones & Carter, Inc., Merchants Way, Suite 170, Katy, Texas ATTENTION: Pursuant to Texas Government Code , you must be able to provide Montgomery County Municipal Utility District No. 24 with a printed, executed and notarized original of a completed Certificate of Interested Parties form (Form 1295) with the bid. Failure to do so will result in the District s inability to execute the contract. To complete the disclosure of interested parties form, or for further information, please visit the Texas Ethics Commission s website at There will be a pre-bid conference in the offices of Jones & Carter, Inc., 1575 Sawdust Road, Suite 400 The Woodlands, Texas 77380, at 10:00 a.m., Friday, April 6, Attendance is not mandatory. bid may be withdrawn until the expiration of 60 days from the date bids are open. DERS Sealed Bids, in duplicate, addressed to Harris County Municipal Utility District No. 538, Attention William R. Murphy, President, Board of Directors, will be received at the office of Jones Carter, Inc., Consulting Engineers, 6330 West Loop South, Suite 150, Bellaire, Texas 77401, until 10:00 a.m. Local Time, Friday, April 13, 2018, and then publicly opened and read for furnishing all labor, material and equipment and performing all work required for construction of Paving Facilities for the FM 529 Left Turn Lane for Katy Lakes Section One for Harris County Municipal Utility District No. 538, Harris County, Texas. Bids received after the closing time will be returned unopened. A pre-bid conference will be held on Thursday, April 5, 2018, at 10:00 a.m. Local Time, at the office of Jones Carter, Inc., Consulting Engineers, 6330 West Loop South, Suite 150, Bellaire, Texas Attendance by each prospective bidder or its representative at the pre-bid conference is not mandatory. Copies of the bidding documents are on file at the following locations: Copies of the bidding documents may be obtained from Bidders must register on this website in order to view and/or download specifications, plans, soils report and environmental reports for this project. There is NO charge to view or download documents. Bidding documents may be examined without charge in the office of Jones Carter, Inc., Consulting Engineers, 6330 West Loop South, Suite 150, Bellaire, Texas ATTENTION: Pursuant to Texas Government Code , you must be able to provide Harris County Municipal Utility District No. 538 (the District ) with a printed, executed and notarized original of a completed Certificate of Interested Parties form (Form 1295) with the bid. Failure to do so will result in the District s inability to execute the contract. To complete the disclosure of interested parties form, or for further information, please visit the Texas Ethics Commission s website at any, will be the responsible Bidder which in the Board s judgment will be most advantageous to HARRIS COUNTY MUD No. 538 DERS Sealed Bids, in duplicate, addressed to Harris-Brazoria Counties Municipal Utility District No. 509, Attention: Ricardo Rodriguez, President, Board of Directors, will be received at the office of LJA Engineering, Inc., 2929 Briarpark Drive, Suite 150, Houston, Texas 77042, until 10:00 a.m. Local Time, Friday, April 20, 2018, and then publicly opened and read for Construction of the Water, Sanitary Sewer and Drainage Facilities to Serve Bakers Landing Section 2B and Townhomes for Harris-Brazoria Counties Municipal Utility District No. 509, Brazoria County, Texas. Scope of Work of the Contract includes the construction of water, sanitary sewer and drainage facilities. Bids received after the closing time will be returned unopened. A non-mandatory pre-bid conference will be held on Friday, April 13, 2018, at 10:00 a.m. Local Time, at the office of LJA Engineering, Inc., 2929 Briarpark Drive, Suite 150, Houston, Texas Connect, and Amtek or may be obtained by prospective bidders or suppliers upon payment of one hundred twenty-five dollars ($ non-refundable plus cost of delivery) ($50.00 for electronic copy) for each set of documents at LJA Engineering, Inc., 2929 Briarpark Drive, Suite 150, Houston, Texas any, will be the responsible Bidder which in the Board s judgment will be most advantageous to HARRIS-BRAZORIA COUNTIES MUNICIPAL UTILITY DISTRICT NO. 509 Sealed bids, in duplicate, addressed to Harris County Municipal Utility District No. 391 will be received at the office of R. G. Miller Engineers, Inc., Park Ten Place, Suite 350, Houston, Texas 77084, until 2:00 p.m., Thursday, April 19, 2018, then publicly opened and read for furnishing all labor, materials and equipment and performing all work required for construction of Storm Sewer, Sanitary Sewer and Water Lines to serve Villages Of Cypress Lakes Section 34 within Harris County Municipal Utility District No All proposals shall be accompanied by a Bid Bond in an amount equal to ten percent (10%) of the total price of the bid contained in the proposal, payable without recourse to Harris County Municipal Utility District No. 391, as a guarantee that bidder will enter into a contract and execute a Performance Bond and Payment Bond in an amount equal to 100% of the contract price, from a surety company holding a permit from the State of Texas to act as surety. The Bid Bond must be enclosed in the same envelope with the bid. Bids without Bid Bonds will not be considered. Inc., Park Ten Place, Suite 350, Houston, Texas 77084, on Thursday, April 12, 2018, at 10:00 a.m. EACH BIDDER MUST BE REPRESENTED AT THIS PRE-BID CONFERENCE. BIDS WILL NOT BE ACCEPTED FROM ANY BIDDER WHO IS NOT REPRESENTED AT THE PRE-BID CONFERENCE. Sealed bids in duplicate will be received by HARRIS COUNTY MUD 249 at the offices of Murr Incorporated, Grant Rd, Ste. 208, Cypress, TX 77429, until 9:30 a.m. on April 16, 2018 at which time all bids will be opened and publicly read for furnishing all material, equipment, labor and supervision necessary for installation of Landscape along Lexington Blvd., Spring TX. There will be a MANDATORY pre-bid meeting for this project on April 11 at 10:00 a.m. on site. Plans, Specifications and Bid Documents are available online at civcastusa.com. HARRIS COUNTY MUD 249 reserves the right to reject any and all bids, and the right to waive any and all irregularities and defects in the bids and in the bidding process, except the time of submitting a bid. Each proposal must be accompanied by a cashier s check or bid bond in the amount of 5% of the total bid amount. The successful bidder will be required to provide Performance and Payment Bonds for the full amount of the Contract. BID NOTICE The Klein Independent School District is accepting electronic bids for Landscape Soil & Materials, Bid # at 2:00 PM on April 20, 2018 in Room 207 of the Central Office Building. Purchasing Specifications, Sealed bids in duplicate addressed to Castlewood Municipal Utility District will be received in the offices of Jones Carter, 6330 West Loop South, Suite 150, Bellaire, Texas 77401, until 10:00 a.m., Friday, April 13, 2018 and then publicly opened and read for furnishing all plant, labor, material and equipment and performing all work required for the construction of: WASTEWATER TREATMENT PLANT LIFT STATION REHABILITATION The project is located in Castlewood Municipal Utility District in Harris County, Texas. The Wastewater Treatment Plant is located at 1350 Brushbird Lane, Katy, Texas Each bid must be accompanied by either a two percent (2%) certified or cashier s check or a five percent (5%) bid bond of the maximum total bid amount. Make the cashier s check or bid bonds payable to the Owner. Plans, specifications, and bidding documents are available at Said documents may be examined without charge in the office of Jones Carter, 6330 West Loop South, Suite 150, Bellaire, Texas ATTENTION: Pursuant to Texas Government Code , unless you are publicly traded entity or a wholly owned subsidiary of the same, you must provide Castlewood Municipal Utility District (the District ) with a printed and signed copy of a completed Certificate of Interested Parties form (Form 1295) and a certificate of filing at the time of bid opening. Failure to do so will result in an irregular bid. To complete the disclosure of interested parties form, or for further information, please visit the Texas Ethics Commission s website at The disclosure of interested parties form shall be included in the bid submittal. There will be a pre-bid conference in the offices of Jones Carter, 6330 West Loop South, Suite 150, Bellaire, Texas at 10:00 a.m., Friday, April 06, Attendance is not mandatory. bid may be withdrawn until the expiration of 60 calendar days from the date bids are open. Sealed bids, in duplicate, addressed to KB Homes Lone Star, Inc. on behalf of Northwest Harris County Municipal Utility District No. 12 will be received at the office of R. G. Miller Engineers, Inc., Park Ten Place, Suite 350, Houston, Texas 77084, until 2:30 p.m., Thursday, April 19, 2018, then publicly opened and read for furnishing all labor, materials and equipment and performing all work required for construction of Storm Sewer, Sanitary Sewer and Water Lines to serve Meadows at Westfield Village Section Three within Northwest Harris County Municipal Utility District No. 12. All proposals shall be accompanied by a Bid Bond in an amount equal to ten percent (10%) of the total price of the bid contained in the proposal, payable without recourse to KB Homes Lone Star, Inc. on behalf of Northwest Harris County Municipal Utility District No. 12, as a guarantee that bidder will enter into a contract and execute a Performance Bond and Payment Bond in an amount equal to 100% of the contract price, from a surety company holding a permit from the State of Texas to act as surety. The Bid Bond must be enclosed in the same envelope with the bid. Bids without Bid Bonds will not be considered. Inc., Park Ten Place, Suite 350, Houston, Texas 77084, on Thursday, April 12, 2018, at 10:30 a.m. EACH BIDDER MUST BE REPRESENTED AT THIS PRE-BID CONFERENCE. BIDS WILL NOT BE ACCEPTED FROM ANY BIDDER WHO IS NOT REPRESENTED AT THE PRE-BID CONFERENCE. PUBLIC BID NOTICE Sealed bids in duplicate will be received, opened, and publicly read by Harris County MUD No. 179 in the office of Eby Engineers, Inc., 1814 De Milo, Houston, Texas, at 11:00 a.m. on Friday, April 20, 2018 for the following improvements located in Harris County Municipal Utility District No 179: DERS Sealed bids addressed to AmeriPort LLC, on behalf of Chambers County Improvement District No. 2, will be received in the office of Ward, Getz & Associates, LLP; 2500 Tanglewilde, Suite 120; Houston, Texas, (phone ) until 2:00 p.m., Thursday, April 19, 2018, at which time all bids will be opened and publicly read for the furnishing of all material, equipment, labor and supervision necessary or incidental to Construction of Roadway Improvements to serve AmeriPort Development. Scope of Project: HARRIS COUNTY MUNICIPAL UTILITY DISTRICT NO. 179 EASTON COMMONS NATURE PARK EXPANSION The project is for site work for 4 acre expansion to existing park and includes excavation and grading of pond and berms, trail construction, storm sewer, and fencing. Bid Documents may be examined without charge in the offices of the Engineer, Eby Engineers, Inc. at 1814 De Milo, Houston, TX 77018, (713) , or may be obtained upon deposit of sixty dollars ($60.00) for each set, which is non refundable. A non-mandatory pre-bid conference will be held at the offices of the Engineer, Eby Engineers, Inc. at 1814 De Milo, Houston, TX on Friday, April 13, 2018 at 10:00 a.m. A Cashier s Check or Certified Check, or bid bond payable to Harris County MUD No. 179 in the amount of not less than five percent (5%) of the bid submitted, as outlined in the Contract Documents, must accompany the bid. The successful bidder receiving Contract awards must furnish Performance and Payment Bonds in the amount of one hundred percent (100%) each of the total Contract price. The Owner reserves the right to reject any and all bids and waive bidding informalities. Those bids deemed most advantageous to the Owner will be considered for the award of a Contract. 1. Approx. 2,810 SY Recycling of existing 6-inch Stabilized Crushed Concrete Shoulder 2. Approx. 21,000 LF Reflective Thermoplastic Road Pavement Markings (white, yellow, double striping, cross hatch) to include raised 2-way reflective markers and raised non-reflective markers 3. Reflectorized Rail Road Pavement Marking 4. Approx. 5 Intersection Street Name & Stop Signs and Thermoplastic Stop Bar Markings 5. Approx. 27 Street Traffic Signs (Speed, Dead End and Stop signs) Plans, specifications and bid documents may be purchased at Ward, Getz & Associates, LLP, for a $75.00 non-refundable fee. A MANDATORY PRE-BID is scheduled to be conducted at the office of Ward, Getz & Associates, LLP, on Thursday, April 12, 2:00 p.m. A bid bond or cashier s check in the amount of 5% of the total bid amount must accompany each bid. The successful bidder will be required to provide a performance bond, a payment bond, and a one-year maintenance bond as provided for in the bid documents, for the full amount of the contract. The Owner reserves the right to reject any or all bids.